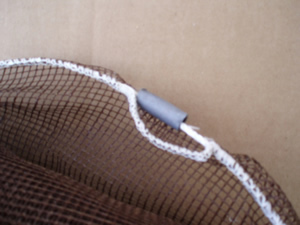 Our seine nets are 125' of netting per 100' of series 450 lb. test braided nylon top and bottom. There are floats every 18" on center with lead 12" on center. 10 ft. seines may have horizontal seam. Heavy Delta is 44 lb. test polyester. 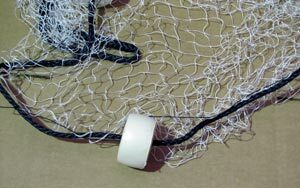 For seine nets under 10 ft., add $10.00. For seines 10 ft. to 25 ft., add $5.00. 650 lb. test rope add .07 /ft. 800 lb. test rope add .011 /ft. 1200 lb. test rope add .17 /ft. 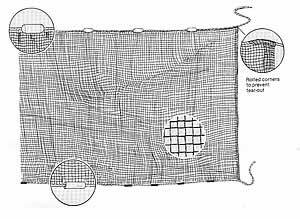 THESE NETS ARE MADE ON ORDER- (MADE WHEN ORDER IS PLACED)- WE CANNOT SHIP THE SAME DAY. TIME IS NEEDED TO MANUFACTURER THE NET, SO THEREFORE PLEASE DO NOT SELECT NEXT DAY AIR. PLEASE SELECT GROUND, AND WE WILL SHIP ASAP. CALL 1-800-211-0518 IF YOU NEED TO KNOW OUR ESTIMATED DATE OF SHIPMENT. 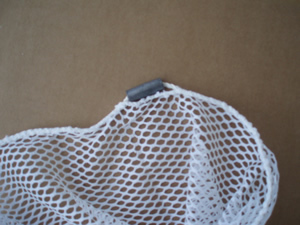 Nylon seines are made with 100% nylon netting. Hung on 5/16" braided poly rope top & bottom. 3" x 1 1/2" floats are every 24" with lead sinkers every 12". Netting is hung on a 1/3 basis. Your choice of 1/2" & 5/8" #139 and 1/2" #6. 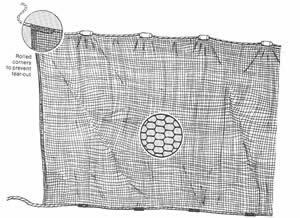 The lock-knitting netting in this seine is made of extra strong, multifilament yarn, to prevent runs and fraying. The seine has a delightful "feel" and ease of handling. It is also mildew resistant for longer life - a very good quality seine. The cords are over edged in the netting for extra stength. 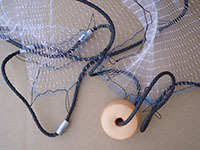 Each net comes complete with floats and sinkers. 4 foot in depth. Made in USA. This is an all-purpose minnow seine - Economical in price, yet superior in quality. It is made of extra-heavy weave, 100% polester netting - the strongest of man-made fibers. Each seine is complete with floats and sinkers. Seines are 48" deep (4 ft.). Made in USA.